In memoir, Barack Obama described meeting half-brother as "painful affair"
NAIROBI, Kenya (CNN) -- George Obama, the half-brother of U.S. President Barack Obama, has been arrested by Kenyan police on a charge of possession of marijuana, police said Saturday. Speaking from behind bars, Obama denied the allegations. George Obama and the president barely know each other, though they have met. George Obama was one of the president's few close relatives who did not go to the inauguration in Washington last week. 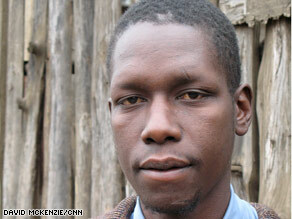 CNN tracked down George Obama in August and found him at a small house in Huruma, a Nairobi slum, where he lives with his mother's extended family. His birth certificate shows that he is Barack Obama's half-brother. The two men share a Kenyan father. In the memoir, Barack Obama struggles to reconcile with his father after he left him and his mother when he was just a child. Barack Obama Sr. died in a car accident when George was just 6 months old. Like his half-brother, George hardly knew his father. George was his father's last child and had not been aware of his famous half-brother growing up. Unlike his grandmother in Kogelo, in western Kenya, George Obama had received little attention from the media until reports about him surfaced in August.